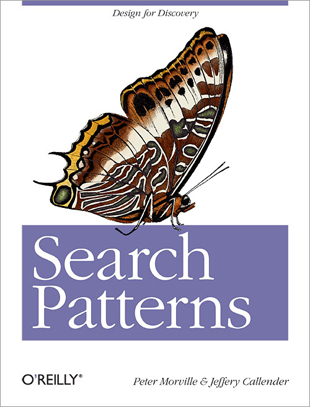 I wanted to talk about a book I recently read, Search Patterns, by Peter Morville and Jeffery Callender. I found that the book made me think about how users search, and how different types of search designs affect the process. At first glance, this book may not seem all that useful – its supposed target is people designing search experiences. In my limited experience, most search boxes our patrons encounter are not designed by us, but by our licensed database vendors, or our online catalogs. But that is also the reason to be interested in the book. Westlaw and Lexis are both transitioning to different interfaces, where the search box is presented to the user as the primary way to access the data within. Reading this book, you can get a better sense of what they are trying to go for, and how we can anticipate how our patrons will be using them. The first chapter describes different ways users find information, and introduces the idea of ‘patterns.’ The second chapter then breaks down the five parts of search: users, interface, engine, content, and creators. The third chapter, and in my opinion the one most interesting to librarians, dives into specific users behaviors. This focus on the user applies not just to search, but I think to information-seeking behavior in general, if we assume that users “search” librarians during reference transactions. The fourth and fifth chapters get into different ‘patterns’ of search, and how different websites are implementing search. Interestingly, several academic databases are mentioned, and the Triangle Libraries Network Catalog is shown several times for its excellent use of facets. This part is a little scattershot in focus, but each individual section is worthwhile. The final chapter is a little out there in terms of scenarios exploring the future of search, but the purpose is to provoke thought. The book isn’t perfect. It is light on footnotes. While the idea of “pattern language,” the foundation of the second half of the book, is properly attributed to the originators of the idea, primarily Christopher Alexander, a good portion of this book seems to be coming from the authors’ minds and experiences. I’m OK with that, as these are not academics, and the audience is not an academic one. However, some more citations to usability studies would have been nice. I highly recommend going over to the book’s website. There is a free chapter, links to many of the illustrations, and a list of the patterns the book describes. People use libraries to find information. This book is about how people search for information. What could be more relevant? This entry was posted in Book Reviews, Legal Research, Technology and tagged design, interface, search. Bookmark the permalink.